Today Ignatius Leong has quietly started his blog - clearly a platform of his own to address the many ridiculous allegations, even outright lies, made against him by certain of his misguided salaried and appointed colleagues (as opposed to being actually elected) in FIDE. I have probably said it before but Kirsan Ilyumzhinov openly admitting to be mixing up FIDE and campaign work is not acceptable and clearly using the organisations funds is another no no. It really is nauseating when everything is now given free for possible votes and his henchmen are running around on FIDE salaries and stipends to win support. But perhaps that pales in comparison to a head of an International Sports body having the use of Russia's assets in each country he visits (the Ambassador in attendance no less) together with promises of largesse from same and that is on top of letters informing National Chess Federations he is visiting without warning and agenda that which at the same time actually instructs (demands?) to arrange meetings with their country's political leadership for him! Can it be Ilymzhinov's FIDE has reached such standing that we now have to take its instructions from its President in our own countries on non-chess matters? 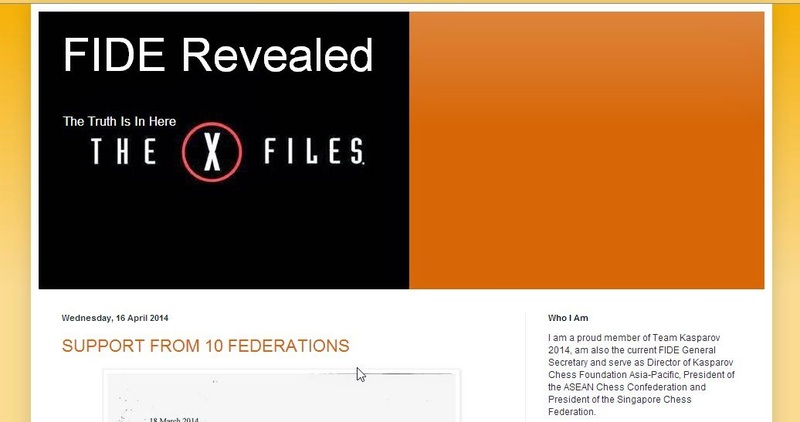 It is hilarious that Leong has named his blog the FIDE X-Files given its long time and completely not credible leaders propensity to tell the public of his alien friends when not trying to keep up a pretence of importance by showing off his non existent friends in high places (Russia of course excluded). And from the first posts in this blog one can see that most certainly "The Truth is in Here" as opposed to the fiction that best describes the working trips the FIDE President posts on the FIDE where he is mostly unwelcome and so meets former leaders, ex-leaders of National Chess Federations, and even more bizarrely even the widow of his predecessor to purportedly discuss his all time favourite topic of chess in schools. I look forward to reading more in this new blog of this FIDE that is led by a Master of the photo opportunity and Grandmaster of the non executed M.O.U.